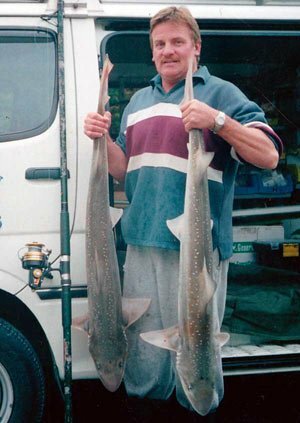 This fine brace of rig sharks was caught surfcasting at Kaikoura by Trevor Petersen. They weighed 9.0 and 9.1kg. Trevor was using 6/0 Mustad Kahle hooks and crayfish for bait. Photo: Kaikoura Fishing Centre. Kaikoura Coast surfcasting beaches stretch from Oaro, south of Kaikoura Peninsula, to the north of Kekerengu. This is a distance of approximately 90 km. Most of this segment of coastline is followed closely by State Highway 1 which generally makes for great fishing access to the beach. There is mile after mile of excellent surfcasting at Kaikoura, particularly north of the peninsula on the Kekerengu coast, where there is more open water, and less rock and kelp. 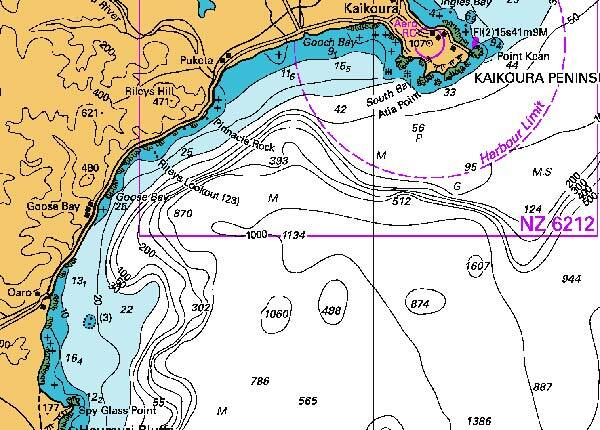 Most of this area north of Kaikoura is isolated and rarely fished. Whereas closer to Kaikoura there is much activity from divers in search of crayfish and paua. Many surfcasters fish the steeply shelving shingle beaches close to the peninsula. The most popular spots are in front of the race course at South Bay and in front of the old railway station. A surfcasting contest is held here each year around Christmas time. 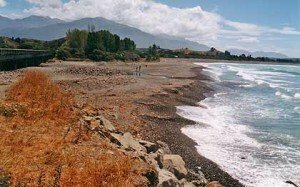 The beach in front of the railway station, close to the centre of town, can be very productive. Surprisingly salmon are caught by anglers spin fishing for kahawai from this beach. I’m not sure why this should be. If you think you know please write and tell me! I suspect these are salmon moving along the coast on their way back to spawning rivers further south. Surfcasters also regularly catch skate weighing 5 kg or so, along with kahawai and sharks. I recommend you have a second spinning rod setup for kahawai with a ticer attached. Even if you cannot see kahawai, or birds working, there is a very good chance they are a few present. Large schools of kahawai are constant along this coast over summer. Using a pair of binoculars to scan the sea for birds working will frequently show “work-ups” you can’t see with the naked eye. It is great fun when a school comes right in close to the beach. A school of kahawai will chase bait-fish right up onto the beach. These schools can move quite fast, coming close to the beach, and then moving off again. This is another reason to have your spinning rod ready at all times. Almost anywhere is good for rock fishing. Wrasse seems to be the most easily caught species, and some of them are quite big. Fishing for kahawai at South Bay. This species is plentiful close in to shore over the summer months. Best targeted with spinning gear. There are reasonable numbers of sevengill sharks along the Kaikoura coast. If you want to try something a bit different you can catch barracouta on heavy spin fishing gear off the rocks near Goose Bay. Use 30cm of light wire to guard against “bite-offs” from their sharp teeth. Cast out as far as you can and start winding. 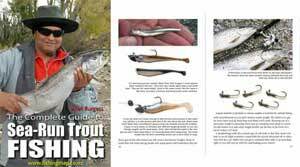 You will be surprised just how easily barracouta can be caught here with this method. I stumbled on this technique while fishing for kahawai from the rocks. On almost every cast I either caught a kahawai or had my ticer chopped-off, one or the other. The ‘coutas make good bait and berley for other species. I had a lot of fun on this during the holidays. Unfortunately the barracouta – they are astonishingly numerous in summer – don’t always bite the wire leader so be prepared to lose some gear! Moki and rig are worth fishing for by surfcasters along the Kaikoura Coast. Use prawns or shrimps purchased from the supermarket as bait instead of cut fish baits. An even better bait to use is crabs or crayfish when targeting these species. Mussels are also worth a try. 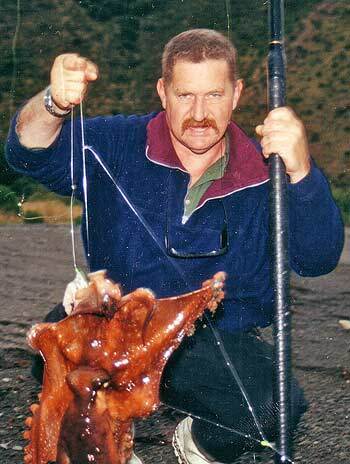 Moki and rig eat shellfish and crustaceans (crabs and crayfish) and are much more likely to take these type of baits. I was surfcasting on the beach at Kaikoura one day when a young bloke came down the beach and started fishing next to me. He had an uncooked crayfish in a small blue chilli bin. He proceeded to chop a section from the tail and tie it to his hooks before casting out. Not five minutes had passed before he landed a moki on the beach. It wasn’t a huge moki, but it was a moki all the same. The rocky Kaikoura Coast is excellent moki ground. Butterfish will readily take small baited hooks. Butterfish (or greenbone) is another species that can be caught along this coast. many believe the only way to catch them is with a spear. This isn’t so. Butterfish will readily take small baited hooks. A great place to fish for them is off the wharf at Kaikoura. The minimum fish length for butterfish at Kaikoura is 35cm. So anything smaller must be released unharmed. Allan Burgess with kahawai taken on spinning gear after jumping out of the car after a school of kahawai while driving along the Kekerengu Coast, north of Kaikoura. When climbing over the rocks in search of a fishing spot watch out for fur seals. They sleep in the sun sometimes causing great fright for both parties when you catch them by surprise. The mouth of the Kahutara River south of Kaikoura Peninsula. Rig and elephant fish surfcasting from the beach together with numerous kahawai schools! There are many excellent surfcasting spots on the Kaikoura coast. On the more open beaches along the Kekerengu coast, large rig sharks can be caught along with elephant fish, kahawai, moki and even snapper. Near Goose Bay, it is possible to catch barracouta for bait on salmon ticers while fishing from rocky outcrops. You have to use a foot of wire at the ticer or they will bite you off instantly. Although some of them must be swimming along with their mouth’s open because they seem to like biting through monofilament. This is great fun all the same! Spinning for kahawai at the mouths of the Hapuku, Kahutara, and Conway Rivers is bound to produce kahawai over the summer months. Cast out as far as you can and then wind flat-out. Heaps of them get off but who cares! The angler doesn’t seem impressed with this octopus caught surfcasting across the road from the main camping ground at Goose Bay, Kaikoura. Although it would have made good bait it was released back into the surf to be caught another day! An excellent spot to spin for kahawai is from the rocks straight in front of the boat ramp at Boat Harbour, Goose Bay. Only fish here when the sea is calm. The odd dangerous wave can come straight over the rocks. Stay off here if there is a bit of a roll on or you will get soaked. You also have to keep an eye out for seals. This is a good bait fishing spot also with large wrasse regularly swallowing the bait. 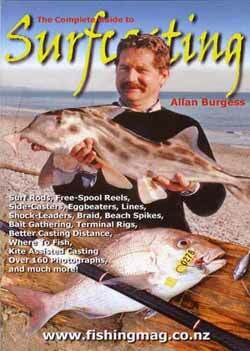 You often find when surfcasting on the Kaikoura coast that some spots are excellent while others seem dead. My advice is that if the fish aren’t biting move further along the coast and try again. You will be surprised what a difference it can make. When surfcasting try to pick a spot clear of kelp with the beach dropping away steeply. 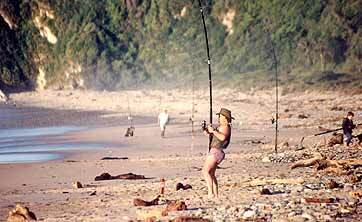 Kekerengu is the best surfcasting area but is some 40 kilometres or more north of Kaikoura Peninsula. The great thing is that you are certain to have the whole beach to yourself as far as you can see in either direction. This is also an excellent area for kite fishing – as is the mouth of the Conway River. The scenery is excellent at Kaikoura. The rugged Seaward Kaikoura Ranges are snow-capped for much of the year and the coastal drive is one of the best in the world and includes many tunnels and tremendous sea views. The train runs next to the road along much of the shoreline. 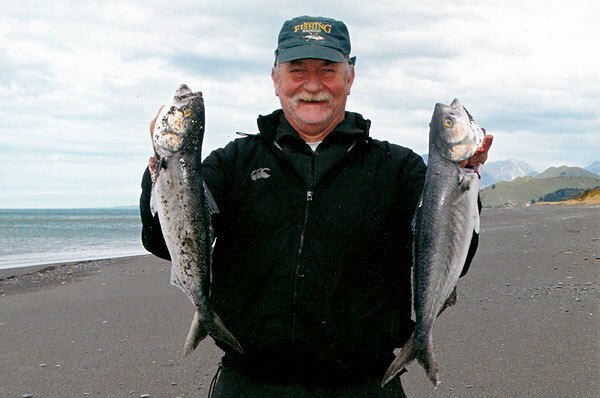 There is always plenty happening for you to watch while surfcasting with whales, dolphins, seabirds, seals, Orca (killer whales) and seemingly an endless number of schools of kahawai and barracouta going up and down for your enjoyment! Surfcasters at the beach behind the railway station in the middle of town. Sourced from NZ63. Crown Copyright Reserved. This is the area off Kaikoura where tourist can see whales close to shore. There is excellent fishing off Goose Bay where the seabed is one kilometre deep just one kilometre from the beach. The area has abundant marine life attracted by nutrient-rich deep ocean up-wellings close to shore. There is sometimes good albacore tuna fishing off the Kaikoura Coast.